We had a lovely afternoon on Xmas, opening presents in the living room together, and receiving calls from friends & family. Wilson was especially happy with the flowering bouquet of colorful socks I managed to find for him online. After his injury, he went through a period of several years where he only wanted to wear black socks. So unlike him! But this year, he has returned to his affinity for the outrageous ones he used to prefer, so I got him a fresh batch, as well as a new pair of slippers. It doesn’t take much, really. The older we get, the fewer things you want. This apartment is already filled to the rafters from years of collecting. These days I’d rather divest than continue to acquire anything beyond what we actually need. 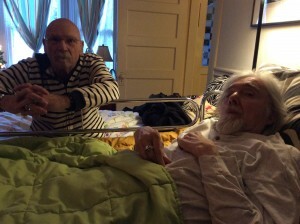 When I moved in with him in 2000, he noticed that I had many things that he, too, already owned. “We have two of everything!” He declared with joy. Now, I’m not so excited about that any more. I’d like to simplify! When we tired of hanging out in the living room, I struggled to my feet off the couch, grabbed onto the walker I’ve taken to using of late, and said “Come on, honey, let’s go in the back and watch a movie.” I turned around to see if he was following me, and discovered he couldn’t get up out of the chair. This happens sometimes, but not very often any more. There was no way I could pull him up myself like I used to do. My back is much too fragile now, and I would injure myself trying. Good thing I realized there were some people smoking pot on our front porch! I hobbled to the door and asked them in to help. They were disoriented a bit for a second when they first entered the living room, looking around in awe at all the art on the walls, and the wacky stuff festooning nearly every surface. “Wow” one guy said “I really like your apartment!” They approached Wilson then, who seemed momentarily wary of these strangers. “This is Wilson” I remarked. “Well Mr. Wilson” one said,”We’re just going to help you get up”. He stretched out both arms, and they gently raised him to his feet. It turned out they were visiting our neighbors, and had heard of him. I laughed, because I was fine with asking strangers in to help! If we get trapped in the furniture again, we might have to wait til Rena came back to work. Not a pretty picture. I’m going to have to get someone to put the new legs on the couch & chairs that I bought three or four years ago, as I’ve let it go too long and am now too crippled to do it myself. They would raise them up so we could get up under our own steam. It’s such a joy getting old, eh? Wilson has been losing ground a little more this past year, I’m sorry to say. He is no longer as talkative in the evenings, and has lost a great many facial expressions. Sometimes he won’t even answer a yes or no question, like “Do you like this movie?” Or “Is this comfortable?” Instead, he will frequently just stare at me. I have to ask a question several times to get an answer out of him. It’s frustrating, and I remind him sometimes that I wouldn’t be repeating myself if he would reply the first time. Then, he will sometimes reveal a tiny smirk in the corner of his mouth, which lets me know that he understands, and is just messing with me. Still playing perverse pranks! And getting extra attention. Thanks to all you Marc Maron fans out there! He talked about Wilson on his WTF podcast a couple of times in the past few months, and retweeted some of my tweets. He has so many thousands of followers that we had an increase in donations to the Trust, especially last month. It really saved us, and I am so grateful. I am a fan of his as well, and was really pleased when I saw his quotes on the inside flap of Wilson’s biography, “Pirates in the Heartland”. Volume Two of his three-volume biography will be out before summer 2015, by the way. So the saga continues. Thank you so much, Marc, for keeping Wilson on people’s minds. We are pretty much hermits, so receiving donations and good wishes from people all over the world truly brings them to our door. 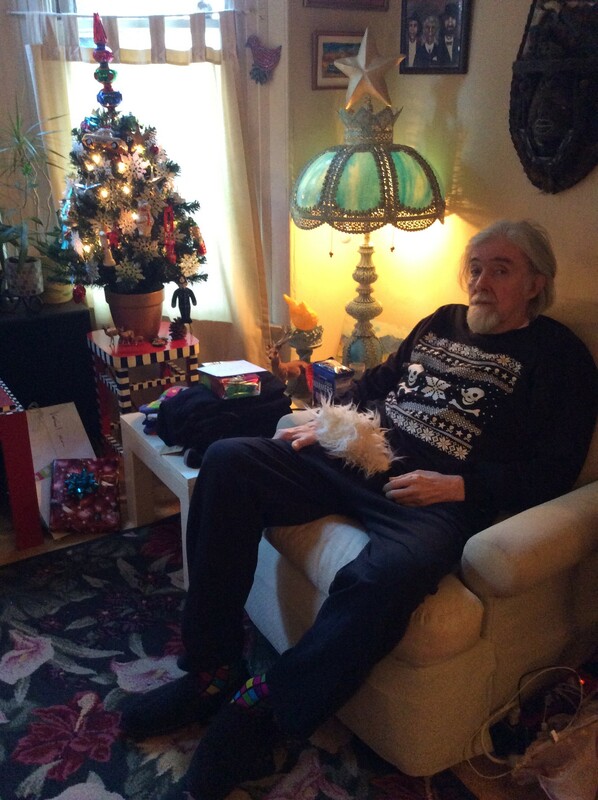 Ken Weaver, of the Fugs, came to visit for a couple of hours on Christmas Eve. It was great to see him. He came all the way from his home in France. He gave us each a sterling silver skull ring from his own collection of jewelry he’d been wearing for years. They are really gorgeous. He is one of the people who can really make Wilson laugh. He is an incredible character, as well as human being. It perked both of us up to be in his company! I just wish he could come over more often. But he does call frequently and tell us all about his travels with his lovely wife Maxine, so we get to live a little bit vicariously through him. I hope you all have a happy, healthy, and prosperous New Year! Thanks to all for your generosity and positive wishes. This entry was posted on Friday, December 26th, 2014 at 10:40 pm	and is filed under Uncategorized. You can follow any responses to this entry through the RSS 2.0 feed. You can leave a response, or trackback from your own site. I left a message for you under the three drawings you posted earlier on this website. I’m not sure how these things work exactly but please know I am trying to contact you.